Another State on the Map. We pulled out of the Boondocking Rally Site on Monday morning and turned the Behemoth west. Time to put another state on the map. We enjoyed the drive through western Arizona and eastern California watching as the desert landscape changed from volcanic rubble to yellow sand dunes. The Saguaro's disappeared and we started to see more yuccas, California fan palms and the occasional Joshua Tree. We had an interesting encounter along the way. These roads are sparsely traveled and don't have rest stops or service areas. We came to an intersection of 2 roads with a clearing big enough to park in and took the opportunity to stop for lunch. The behemoth met her sister at a roadside pull off in the California desert. As we pulled into this unofficial rest stop Fred pulled right up beside a Tiffin Phaeton that looked just like the Behemoth. The couple that owned it were from Yucca Valley, California close to our destination. They are part time RVers on vacation, starting a trip to Arizona. We enjoyed talking to them and all took photos of the "sister" coaches side by side. We left the Sonoran Desert behind passed through the Colorado Desert and ended up in the Mojave at Twentynine Palms RV Resort. We planned this stay to experience the Joshua Tree National Park and were happy to see the changing landscape. The National Park has 3 Visitor Centers. The closest to our park in Twentynine Palms is the Oasis Center. It is used less than the entrance in Joshua Tree and we were advised that there would be less wait time. This Center sits on the edge of the town of Twentynine Palms and marks the place of the Oasis of Mara. The Oasis was settled centuries ago by the Serrano people who farmed the area surrounding the life giving water and planted the original 29 fan palms in celebration of the 29 boy children born in their first year in the settlement. There is a short nature trail through and around the oasis that is enhanced by plantings of Deergrass, Burro bush, Creosote bush, Mesquite and Barrel and Cholla cactus. We enjoyed listening to the Cactus Wrens as we walked the trail. Gambel's Quail, Hummingbirds, Roadrunners and Chuckwallas were all enjoying the lush environment. I was sad to learn that two weeks after our visit the oasis garden was destroyed by an arson fire. Joshua Trees are odd looking other worldly botanical specimens. Rangers told us where to find the most extensive groupings of Joshua Trees in the park and we set out in the Jeep to see some of them up close. Joshua Trees are actually a large form of yucca. They grow tall and have twisted arms with spiky green growths on the ends of them. The "bark" is pointy and uncomfortable to brush up against. The trees lean in many directions seeming to follow the direction of the wind and the weight of their branches. The tortured shapes are otherworldly. They would seem at home in a Dr Seuss book or on a remote planet in an episode of Star Trek. It was pretty amazing to see so many of them in one place. They seem to thrive in this protected environment of huge rocks and sandy desert soil. Joshua Tree National Park has some impressive rock formations. Our favorite was the aptly named skull rock, a popular stopping spot on road. It is reachable via a short trail and a bit of climbing. 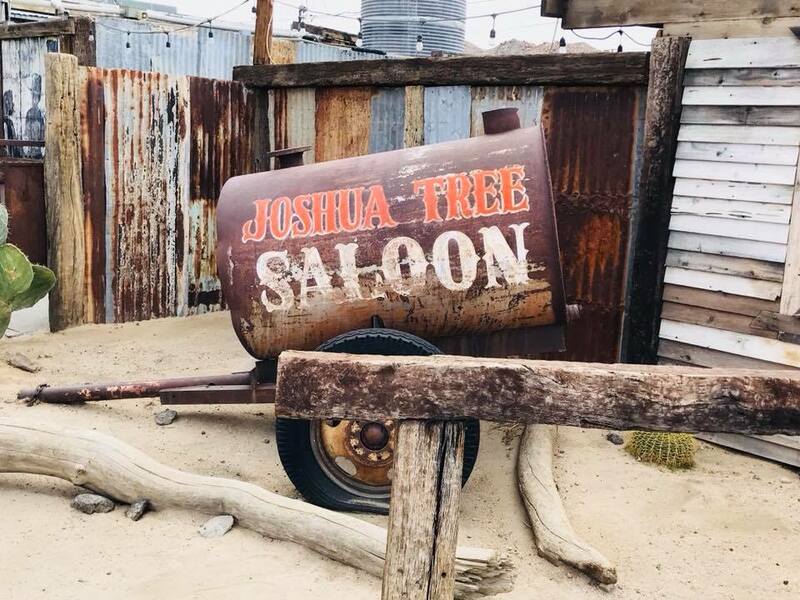 We enjoyed the scenic drive through the park and ended our afternoon's explorations at the Joshua Tree Saloon. We observed a long line of traffic waiting to get into the Park via the Joshua Tree entrance making us happy to have taken the drive from the opposite direction. I wish we had been lucky enough to spot a desert tortoise. Joshua Tree is a small artistic city with an active downtown that takes advantage of the tourist trade stimulated by the park. There is a a unique gift shop that has a shower house. Seven dollars for a 10 minute shower must sound like a great deal after rustic camping in the dusty desert of the National Park for a week. The World Famous Crochet Museum used to be a Foto-mat. We enjoyed coffee at the Joshua Tree Coffee Roasters and were amused to find a small building that had been converted into a Crochet Museum. Reclaimed glass window at the Joshua Tree Coffee Co.
Their are murals to enjoy, fences adorned by iron work and glass bottles, and beautiful stained glass windows. I appreciated all of the recycling and reuse of materials in the original design elements. 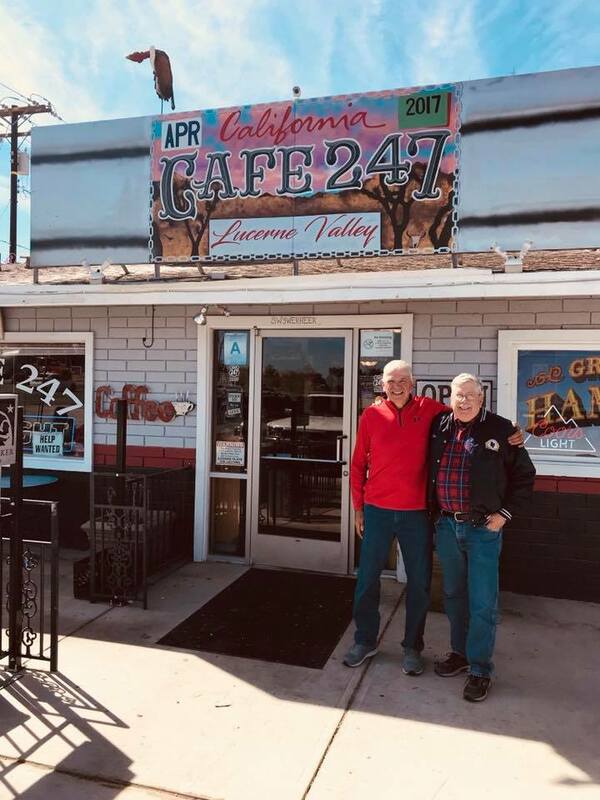 Fred and Rick Groff at Cafe 247. Rick is wearing his Malta Ridge jackey! Fred's friend Rick lives in southern California. Rick and Fred served together in the Malta Ridge Volunteer Fire Company for many years before they both retired and left New York. We were close enough to meet for lunch in Lucerne Valley at Cafe 247. I found this little cafe in a google search of the area. Rick wasn't familiar with it either so it was an adventure for all. The burgers didn't disappoint and I really liked the sweet potato fries. They were doing a brisk business in ice cream mid afternoon. It was great to catch up with an old friend and to share a new experience with him. Twentynine Palms was a great stop as we ease back into travel mode. Headed deeper into the Mojave Desert now, next stop Death Valley. That's really sad about the 29 Palms oasis, Bonnie. Glad you were able to see it! Those palms were huge. I’m sure it will take many years for new ones to reach maturity.